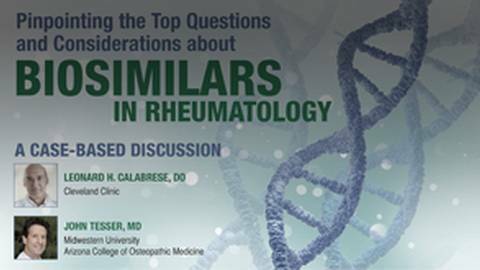 Experts discuss biosimilars and use clinical cases to review utilizing these agents in rheumatology practice. This activity provides patient and practice-specific biosimilars content for clinicians in rheumatology practice. Many clinicians are lacking knowledge regarding exactly what biosimilars are, how they are formulated, and how they differ from originator biologic agents. 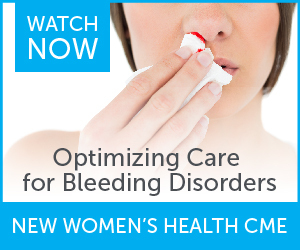 Clinicians also lack clear, accurate, and thorough information regarding the regulatory review and approval process, and related FDA guidance, including the process for/meaning of extrapolated indications and interchangeability designations. Despite the fact that some biosimilar agents are now FDA-approved and many more are expected for review/approval in the near future, practicing rheumatologists are not currently equipped with adequate knowledge regarding specific agents and how to safely and effectively apply them to actual practice, as well as respond to patient questions regarding efficacy and safety concerns. In accordance with the ACCME Standards for Commercial Support, The France Foundation (TFF) require that individuals in a position to control the content of an educational activity disclose all relevant financial relationships with any commercial interest. TFF resolves all conflicts of interest to ensure independence, objectivity, balance, and scientific rigor in all its educational programs. Furthermore, TFF seeks to verify that all scientific research referred to, reported, or used in a CME/CE activity conforms to the generally accepted standards of experimental design, data collection, and analysis. TFF is committed to providing learners with high-quality CME/CE activities that promote improvements in health care and not those of a commercial interest. Leonard H. Calabrese, DO, has served as a consultant for AbbVie, Bristol Myers-Squibb, Centocor Biotech, Genentech, GSK, Horizon, Janssen and Pfizer. He has received honoraria from Crescendo Bioscience. John R. Tesser, MD, has served as a consultant for Amgen, Bristol-Myers Squibb, Crescendo Biosciences/Mallinkrodt, Genentech, Janssen, Lilly, Medac, Pfizer, Sanofi-Genzyme/Regeneron and UCB. He has served on a speaker’s bureau for AbbVie, Amgen, Bristol Myers-Squibb, Crescendo Bioscience, Genentech, Janssen, Lilly, Medac, Pfizer and UCB. He has received research grants or support from AbbVie, Ablynx, Amgen, AstraZeneca, Bristol Myers-Squibb, Boehringer Ingelheim Pharmaceuticals, Inc, Celgene, Genentech, GSK, Janssen, Lilly, Merck KG, Novartis, Pfizer, Sandiz, Sun Pharma, and UCB.